Requirement: Clicking on a documents in a SharePoint 2013 document library, opens the document directly in browser, Where SharePoint 2013 farm is configured to use Office Web apps. End-users wants to open office documents client applications such as Microsoft word, Excel, etc rather opening them in browser. Disable office web apps in SharePoint 2013 for entire farm. Disable Office Web Apps for a particular File type. Enable opening documents in client applications at Site collection level. Change office documents opening behavior in SharePoint document library settings. Enable/Disable opening documents in client applications at Site collection level. Log into SharePoint site >> Go to Site Settings. Click Site collection features under Site Collection Administration section. 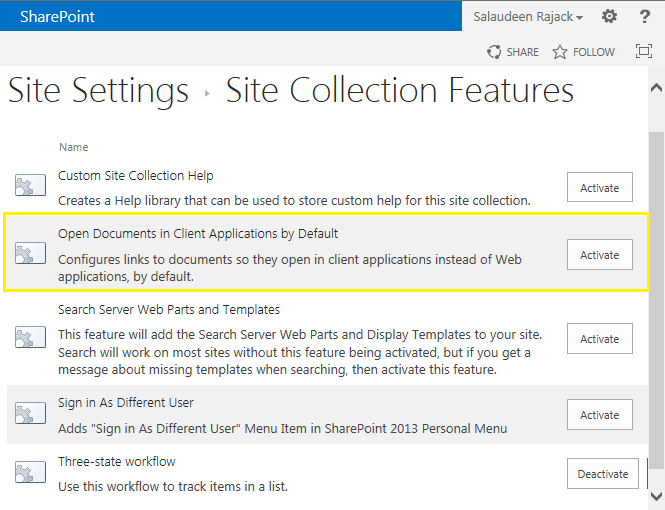 This feature suppresses Office Web Apps in SharePoint 2013 site collection. Click on "Ok". After changing this setting, when users click the document in SharePoint site, it will be opened with Office client application by default. These steps remains same to disable office web apps in SharePoint online as well. Navigate to the SharePoint document library >> Click on "Library Settings" icon from Library tab of the ribbon. In library settings page, Click on "Advanced Settings" under general settings group. In Advanced Settings page, scroll-down and go to the "Opening Documents in the Browser" section to choose the default behavior. The default setting is "Use the server default".